I dropped by 3 Friends Coffee today to check out the poetry open MIC. Dan Raphael was featured and I didn’t want to miss that. We’ve read out a few times together, he immediately inspired me when I heard his kaledioscopic sensory metaphors hanging in the air like strange and beautiful crystals on a big astral chandeleir. I was not disappointed. What I heard was a mirror of what has been resonating (or perhaps simmering) beneath my mind for a long time: the sound of the fragments of world tearing apart- and possibly being recombined into whole new modes of being. Then later on that night! Walt Curtis– AKA Oregon’s Poet Laureate- got up, some time after all the rest of us read, and read a poem while in a full on nosebleed. He had on a straw hat over his polar fleece cap. It was, as Ed might have oft mentioned, in the shape of a “perchy hat.” You’ll have to ask him what that means. He had a hard time getting through the whole poem, he remarked, because of feeling like he is almost going blind. It did take him quite a while, but it was also an epic, whimsical and allegorical poem about his black umbrella. Walt later came up to me and remembered me and wanted to introduce me around. 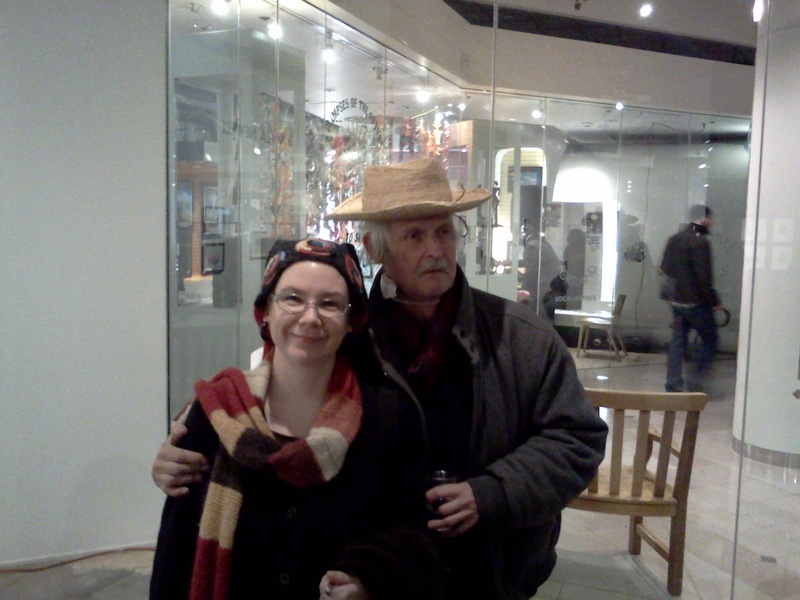 He was saying I had been “an important part of the poetry scene.” He encouraged me to come back another Monday. Oh BTW: The open MIC people, Show and Tell Gallery, announced they publish podcasts of the weekly readings and archive them on their site. So you can hear me reading live in perhaps a couple of weeks. Look for the show on 12/17/12.